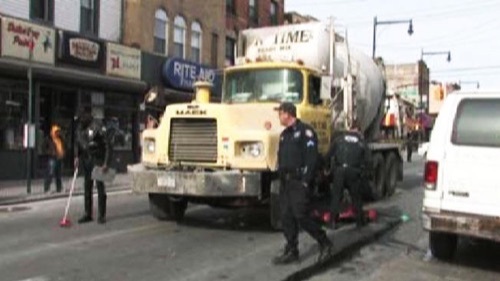 A cement truck driver killed a pedestrian in College Point last week. Accounts differ on how the crash occurred, and police have filed no charges. On Friday, January 22, at around 9:21 in the morning, 61-year-old Nancy Ventura was crossing College Point Boulevard at 15th Avenue, east to west, when she was struck by the driver, who was southbound on the boulevard, according to NYPD. Ventura lived a block away from the crash site. She died at New York-Presbyterian/Queens Hospital, police said. The Daily News reported that, according to unnamed police sources, the victim “was hit by the cement truck as it made a turn onto 15th Ave.,” but the NYPD public information office could not confirm if the driver was turning or not. Photos from the scene show the truck stopped on College Point Boulevard, with the cab facing away from 15th Avenue — so it’s possible the driver was turning off of 15th, but not onto it. NYPD often releases conflicting details on serious traffic crashes, and information initially provided by police sources often turns out to be wrong. It’s usually not possible to obtain a final NYPD crash report without a freedom of information request, which — if approved — can take months for the department to process. No summonses or charges were filed by NYPD or Queens District Attorney Richard Brown as of Thursday afternoon, NYPD told Streetsblog. “No charges were expected to be filed,” the Daily News reported. This fatal crash occurred in the 109th Precinct, where the response to pedestrian deaths is lecturing people on how to walk. To voice your concerns about neighborhood traffic safety directly to Deputy Inspector Thomas Conforti, the commanding officer, go to the next precinct community council meeting. The 109th Precinct council meetings happen at 7:30 p.m. on second Wednesday of the month at the precinct, 37-05 Union Street in Flushing. Call 718-321-2268 for information. The City Council district where Nancy Ventura was killed is represented by Paul Vallone. To encourage Vallone to take action to improve street safety in his district and citywide, contact him via phone, email, or Twitter. walk around with a little old lady for a bit and you’ll soon realize how terrified They must be Every time They go Out. I saw this first hand crossing 164th Street with my mom. We had to start moving a few seconds before the walk signal came on. Even then we barely made it across. I had to physically block turning cars a few times. Unless the streets change radically by the time I get too old to walk at a decent clip I would seriously consider getting one of those scooters just so I could make it across the street without getting stranded. We both know the problem is streets designed more like highways, but NYC is loathe to do anything about it, or to reduce the volumes motor traffic. We have a little kid and it’s the same. He’s 4 years old and has 100% understanding of and compliance with walk and don’t walk signs and never goes into the street with a red/don’t walk sign. But I can’t see him being capable of crossing streets on his own for years, since even with “walk” cars just turn and bully there way past pedestrians. It’s nuts. But I’m not sure the only issue is the street design. Even when we’re walking to his school and traffic is crawling, turning cars act like 5mph bullies pushing there way through. If the name is any indication, the training would involve how to get there on time, and how important it is that they get there on time.